“Surfskis are unsafe! They’re not seaworthy! You’ll never be able to paddle such a tippy craft for 70km!” It took two years of argument – but surfskis were allowed into the Hiddensee Marathon for the first time this year... and are here to stay! In Germany, Olympic-style flat water racing and disciplines such as downriver racing and slalom are very strong. On the other hand you have recreational kayakers and, in a completely “parallel world”, life saving events that include spec ski races. The annual Hawaiian Sports Festival in Rerik is one of the few opportunities where both worlds meet. Sea kayak races are not common, but there is an ever increasing number of paddlers interested in marathon races on flat water and on the sea. While some of the sea kayakers are looking for ways to push their boundaries, an increasing number of flat water and downriver racers have discovered that competing under sea conditions is not only challenging but fun. 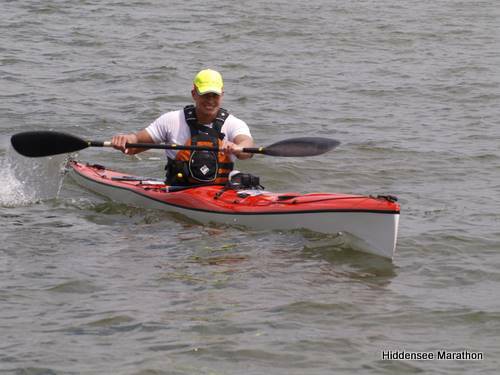 The Hiddenseemarathon was born out of a silly idea of some guys from the local kayak club who thought “Why don’t we try our two and a half day overnight trip in one go”. Since then the race has been held every year except 2009 when exceptionally heavy conditions made a safe start impossible. In 2004 the race did not circumnavigate the Hiddensee island because of massive seas. The course was set inside the “sheltered” Bodden and back again on the same way (in fact a lot of people had to give up and were spread over the surrounding islands looking for shelter and dry ground under their feet). The race record was set in 2005 by a well-known German marathon paddler with his Arctic Star in 6 hours and 40 minutes (The weather conditions were perfect. Probably conditions you have once in hundred years: The first half of the course was no wind at all and a calm dead sea. The second half a thunder storm came in from the north blowing the first fifth of the field right back to Stralsund “surfing their brains out” while most of the rest had to quit due to the weather change). Whether you compete to win or you want to test your own endurance and stamina, the event is a benchmark and a true test: there are no currents to help and even if the wind right for a downwind it turns into a cruel headwind for half of the course. The Hiddensee Marathon is a gruelling 70km through the waters of the Baltic Sea. Start and finish is at the clubhouse of the “Stralsunder Kanu Club”in Stralsund. The course makes its way out of the Strelasound then turns west to the exposed side of Hiddensee Island and rounds the so called “Harke” at the northern tip. The paddlers then head back mainly in a southerly direction on the Bodden See and back into the Strelasound. Participants have to navigate according to the rules of the national park. Conditions vary from grinding shallow waters, choppy steep and short side waves to some bigger waves along the western part of Hiddensee Island depending on weather conditions on the day. Racer categories include: K1, K2, K2 mixed and open class (ski, outrigger) for ages <40; 40-60 and 60+. Friday, 20:00: All the participants attended the compulsory briefing. No briefing, no race! Sleeping arrangements were available in the gym or in rooms as well as a limited number of camping sites. The weather forecast: a weak Beaufort Force 3 wind mainly from the west/north west which meant that there would be no downwind on the one hand and no excessive headwind on the other hand. Participants would mostly have to deal with a more or less unpleasant side chop. 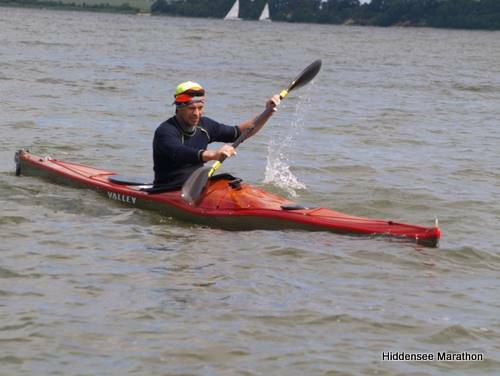 This year the Hiddensee marathon saw the biggest field ever: 40 boats with 51 athletes. Boat classes are Open (Surfski and outrigger), kayak (which vary from “floatsam” to serious sea racers) and doubles. Most of the athletes had had a short night before they saw a nice morning with a bright sunrise at 6am (Not my workout time at all! A torture for owls; a big advantage for larks!). 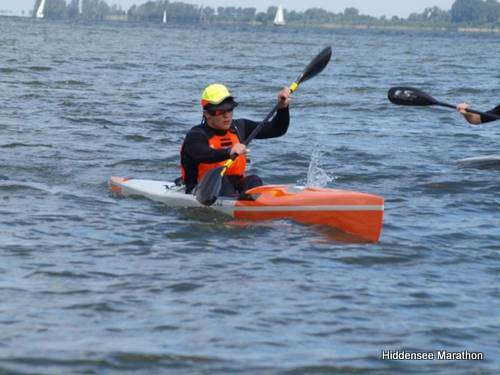 From the start, Maik Lojak, in his heavy sea kayak, showed that he hadn’t come to Stralsund to sightsee. Paddling at an average of more than 11km/h, he made us Surfski paddlers wonder if he was planning for 2 or 70km. 10km in the race the headwind had increased up to 3 to 4 Beaufort and in the lead there was a pack of Maik Lojak, Simon Petereit and Steffen Burkhardt (a multiple German marathon winner looking for some new challenge within the kayak game). The second pack comprised locals Micha, Max and Simon Augustin. The rest of the field formed a long chain heading out of the sound. On the open ocean, west of Hiddensee conditions became confused and the strong side wind kicked up unpleasant choppy waves. 3 ½ hours and 35 kilometres later, the leaders reached the “Harken” - the turning point of the race. Lojak had put the hammer down and was still in the lead with Steffen Burkhardt close behind. Micha had nearly joined the leaders while Simon Petereit had lost some ground due to the sea conditions. The first 3 kilometres back on the return leg were downwind, but they also would be the last until the very end of the Strelasound where nice little waves would bring the exhausted athletes back home to the finish line. Somewhere along the line Steffen Burkhard decided to take a slightly different line to Maik Lojak which turned out to be the wrong choice in the end. In the end Maik Lojak was the man of the day. Taking into consideration his relatively slow kayak he paddled in a different world. His time 6:47, although not a new course record, was unbelievably fast considering the conditions. Congratulations! Second and third were Steffen Burkhardt and Simon Petereit, both on Surfskis, followed by another kayaker Micha Klawitter in his brand new shiny Rapier 20, sadly missing the 7 hour barrier by 8 minutes. On the end of field there were some teams who had been paddling for more than 9 hours but they finished which is something that cannot be guaranteed at “Germany’s toughest Seakayak and Surfski race”! Micha - Local Hero #1! Thanks again to all the volunteers and the organising team - they did a great job. After the race the coffee, cake and barbecue were excellent. Competitors were also provided with a relaxing massage (and some cheers!). What about Surfski versus kayak? Truly the advantage is on the side of the Surfskis. They are lightweight and if you have the chance to surf you´ll surf away. 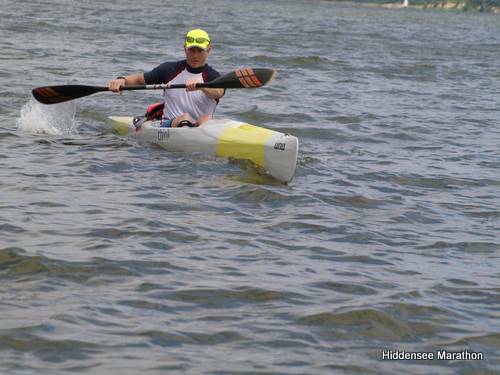 On the other hand the race showed that a course like the Hiddensee marathon where only relative slow average speed can be realised due to the conditions HP Sea(racing) kayaks are competitive. In the end, and that is for me the most pleasant conclusion, Maik showed us that it is the paddler and not the boat who wins a race. I hope to see Maik next year on a Surfski! Hopefully in 2011 the marathon will see some athletes from other countries and Maik on a Surfski to mark a new course record to celebrate the 10th anniversary of the event. Icon Classic - UK Paddlers Conquer "Death Point"! Hawaiian Sports Festival (Germany) Ups the Ante!